How To Write Great Guitar Solos That Grab People By The Throat And MAKE Them Love Your Guitar Playing! Have you ever tried writing your own guitar solos but find yourself struggling to make them really awesome because your guitar solo ideas really just sound like a bunch of licks strung together? The solo tends to sound more like you are just going from one idea to another idea - something is missing, your guitar solo is simply not "truly jaw dropping great"! You probably already know how to play some cool guitar licks and maybe can even play other people's songs and guitar solos, but when you try to create your own it's just not as good as you had hoped. Think about your lead guitar playing as it is right now… some parts of it probably sound pretty good (or at least 'ok'), but other parts of it are not good enough (otherwise you wouldn't still be reading this)… now think about your favorite singers… do they sing as 'fast' than you can play? No… Do they sing with more notes than you play in your leads? No… If we take out all the words and make your favorite singer sing 'la la la', it would STILL sound great, right? It's not about 'the sound' of their voice, it's about what they 'do' with their voice that makes a singer great. The good news is, every single thing the best singers do, YOU CAN DO on your guitar! 1. They choose the right note to sing in the right moment. 2. They have become masters at connecting one note to the next note. 3. They are great at ornamenting important notes with vibrato and glissandos. Can we (as guitar players) learn to do all of these things? YES! 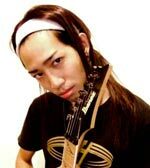 In fact, your favorite guitar players are already doing it! 1. Choose the right note to play in the right moment? 2. Connect one note to the next note in a really cool way? 3. Ornament important notes with vibrato and glissandos (string bends for example) in really awesome ways? Guitar players like yourself find it very hard to learn how to do these things by listening to great guitar players. Why? Because there are so many different things to listen for in your favorite guitar solos, there are often fast parts and other things being played that naturally distract your attention from the CORE elements that make the playing truly great. However, when you listen to a great singer, NONE of those other elements are there to distract you! You basically only hear good note choices, excellent connection between the notes and great ornamentation of notes in a very easy-to-hear way. When great singers sing, every single note is important… it has to be because there is a word (or part of a word) on each note sung, plus, unlike guitar players, singers can't sing notes fast, so each sound stands out more and can't afford to be 'unimportant'. Because of these facts, singers are focused on the micro level, they are forced to make every note matter. Most guitar players don't think in this way, instead they think in terms of licks, riffs and other groups of notes. This happens because guitar players can play faster and there is often little time to be concerned about the expression of each note. They approach guitar solos on the macro level. Great guitar players think in both ways at the same time. And that is exactly what you should do. The next problem is, virtually all guitar teachers (and instructional products and videos) teach lead guitar by having you learn about all the guitar techniques, scales, arpeggios, licks, picking, etc. etc. They don't ever seem to get straight to the core of what makes a great guitar player great. Instead, you should be listening to great singers FIRST and then learning how to use the basic elements of great singing into the basic elements of great guitar playing... because they are EXACTLY THE SAME! …So, if it's that simple, why doesn't everyone do it? 1. Most teachers and students don't really know exactly what to listen for. 2. Virtually all teachers and students also don't know how to take the important elements of great vocal melodies and transform them into great guitar playing. Instead, what happens is they end up simply repeating a slow vocal melody without understanding how to integrate the vocal ideas with all the other guitar techniques, notes and sounds that are needed to create great guitar solos. 3. Virtually all teachers and students simply never discovered this secret to create guitar solos that are "truly jaw dropping great" instead of just playing a bunch of guitar licks. What if you had an expert guitar teacher and a great singer (Fabio Lione - Rhapsody Of Fire) to show you exactly what you need to do? What if they broke everything down for you so that you can really see, hear and understand how singers think and how to apply that to your guitar solos, right before your eyes? What if they then showed you real life examples of how each vocal melody element was integrated with each guitar soloing element so that you understand clearly how all of this really works so you can actually use it yourself? That's exactly what I've done for you. For the first time ever, a revolutionary video series has finally been created to teach you all of that: the How To Write Great Guitar Solos video series. Imagine yourself creating guitar solos that are so unique, awesome and impressive that they grab people by the throat, shoot lightning bolts down their spine and compel them to love every note you play! Isn't that what you want? … Of course you do, EVERYBODY wants this! In fact, many guitar players just like you travelled across the world (and paid thousands of dollars to get here) to be a part of this revolutionary "How To Write Great Guitar Solos" video series as it was being recorded live in Chicago, USA. You are about to discover how to create better guitar solos faster and easier than you've ever done before. You'll get brand new ideas to create great guitar solos that you probably would never think of. Plus, you will be one of the very few people who ever learn what the best guitar players instinctively do to create mind-blowing guitar solos at any speed (slow solos, mid temp solos or fast solos). 4 live video recordings (25-45 minutes each) so that you can focus on each of the 4 revolutionary aspects of this elite master class and not get overwhelmed with too much to learn at once. Totally new ideas to create great guitar solos that you've never even thought about (or heard of before) so that you have another incredibly powerful tool to use in your own songs and guitar solos. You'll finally learn how to begin the process of writing your own great guitar solos without getting stuck because you're not sure how to start or how to create the next phrase or idea. Because this method of creating awesome guitar solos is so innovative (and not at all like what average guitar players use) you won't sound like all the 'average' guitar players out there. … And the best part is, the concepts you will learn are easy-to-understand so that you can get started to use them in your playing almost immediately. BONUS 1 - How To Create Intense Emotions In Your Guitar Playing - Sample Lesson Question: What is the Holy Grail of guitar playing? Answer: To express yourself musically in a way that makes people feel EXACTLY what you want them to feel when you play your guitar! You are about to receive an important sample of my video series: How To Create Intense Emotions In Your Guitar Playing. In this sample lesson, I will show you which note to play (in any song) that makes you and your listeners feel the most dramatic and desperate emotion possible from a single note, so that you can put that maximum drama in any song, at any time. Just as importantly, you are going to learn how to identify that note when listening to other people's music too. Once you learn how this works with this special note, you will begin to understand what has to happen to repeat the process for all the other notes on the guitar, for any song. BONUS 2 - How To Make Your Guitar Solos Fit The Song - If you have ever tried creating a guitar solo that has some cool ideas in it but simply doesn't seem to 'fit' the style and mood of the song, this video will help you. accurately and artistically match elements of the song with the guitar solo ideas you are trying to create so that the final result is the perfect solo for that song. hear where your guitar phrases should start and end and how long they should (and should not) be. You've learned a lot about how to play guitar solos and many of the techniques that go into great guitar playing. But none of that matters until and unless you are finally able to create guitar solos that fit the song you are playing. Yes! Tom, I want to get access to all of this now. You want to hear your own guitar solos and be blown away and think, WOW! That awesome guitar solo is…. MINE"! Don't miss out on this opportunity. Now I want you to click on the orange "Add To Cart" button above, fill out the simple form on the next page and then click on the Buy Now button on the following page. 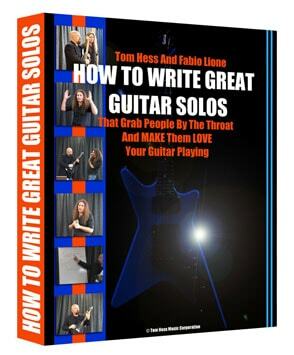 "The How to Write Great Guitar Solos Master Class is mind blowing." that hold true in each of the solos. Mr. Hess helps the student to understand these fundamental concepts in this master class, concepts such as dynamics, vibrato, vocal pitches, pitch range, and much more. It helped me to understand how to make and play guitar solos in different ways by applying Mr. Hess's singing concepts in my playing. Great guitar techniques are good but with Mr. Hess's singing concepts you will become 10 times better than before. This master class really helped me to make my guitar sing more than ever. Before even picking up the guitar I could see my guitar skills improving to the next level as each new concept came to light. Thank you Mr. Hess for making this awesome master class; your unique guitar soloing concepts are very special to me.